For anything truly innovative and new, the category has to start from nothing and grow into something. We always hear about companies that are leaders in their category, and the category is well-defined and generally agreed-upon. When people tell the company’s story, it’s often as if the category was just sitting there, in all it’s clearly defined glory, desperately hoping someone would come in and take it over. But the reality is often much more complicated. For anything truly innovative and new, the category has to start from nothing and grow into something. For companies that play in a not-yet-defined space (“category creators”), life is different from entrants who just stroll into existing categories. 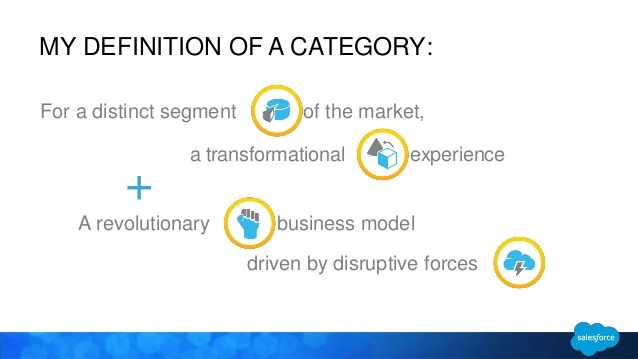 In the first part of his presentation, Mark explored categories and category creators. 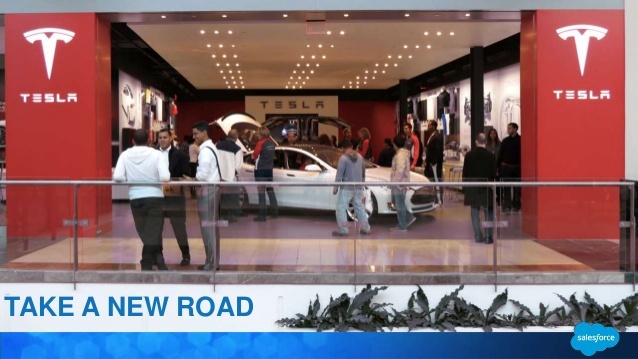 Mark began (slides 2-4) with some examples of companies that have played a significant role in creating entire new market categories, including Uber, Tesla, and Salesforce, and he showed the respective vision of each: “Moving people”, “Take a new road”, and “No software”, respectively. Mark explained how each of those companies had successfully created an emotional response in their audience that went far beyond simply promoting their brand. Those two look like they’re enjoying a wonderful evening. Emotion! As the next example, Mark told us the story of Eloqua: how it started as a chat interface for sales people to engage with customers, but over time had to change and grow, ultimately becoming a marketing automation platform. Critically, during that evolution and the many changes that it brought, the company’s mission and vision did not change. So, it’s important to get that part right! If your vision is truly transformational and audaciously large, then you’ll still have plenty of room to tweak the mechanism by which that vision is achieved. If your vision is truly transformational and audaciously large, then you’ll still have plenty of room to tweak the mechanism by which that vision is achieved. As his final example in this introductory segment, Mark talked a little bit about Influitive and advocate marketing (which I found quite reminiscent of much of the message of Youtility). Mark sees advocate marketing as a large, long trend, that will turn into a category in and of itself that is chock-a-block full of opportunity. If you take those four elements and apply them to all the company examples already mentioned, then you’ll find that things align very nicely (slides 8-11). 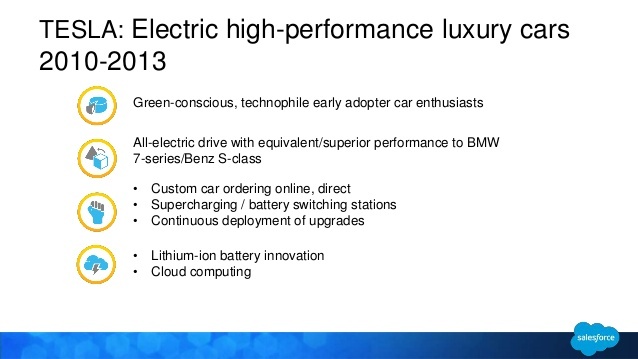 Examining Tesla’s category against Mark’s definition. But where do these new categories come from? In Mark’s view, one can’t go out and say “I’m gonna create a category”; instead, categories emerge (“unearthed”, as Mark puts it in slides 20-21) when a separated population of people who don’t quite identify with existing roles – outcasts, if you will – start to speak up and stand up. For instance, for many years there were scattered people all over in marketing departments who would fervently shout “I’m not a marketer, I’m a demand generator!” to anyone who would listen. At first, not many people listened. Over time, though, all those demand generators – who emphasized repeatable processes, statistical analysis, and top-level lead creation – started to control budgets and air their grievances with existing vendors and entrepreneurs. Not too long after, the marketing automation category emerged in spectacular fashion. These early outcasts have missionary zeal about their category, above and beyond what they feel for their own company (slide 22); they identify with this new thing as much as they don’t identify with existing convention. And they talk to each other. And they get together. 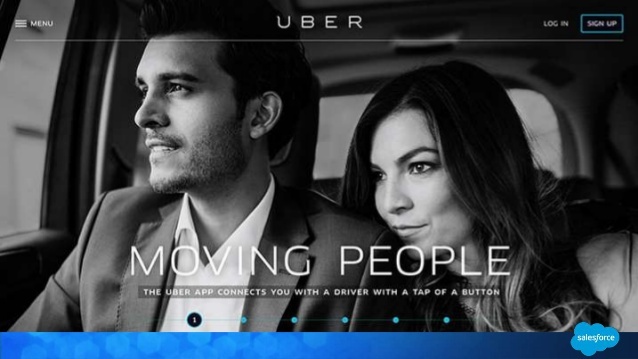 And they reward companies who fill the needs of this emerging category. As a result, companies who create categories tend to have much higher growth rates than their peers (slides 13-17) and enjoy benefits on the valuation side of things (slide 18). So, what do you do if you find yourself at the forefront, trying to define a new category? We’ll explore that in The Six Rules of Category Creator Go-to-Market.